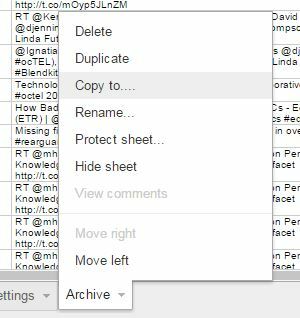 After the copy has been complete open the new template and delete the existing Archive sheet and rename ‘Copy of Archive’ to ‘Archive’. In the Archive sheet select the id_str column and Format > Number > Plain text. Repeat also for the in_reply_to_status_id_str column. Finally from the TAGS menu select Run Now! to trigger authentication. Remember to setup and automatic data collection you had in place and enter the search terms you were using on the Radme/Settings sheet. Still in the Script editor select all the code in the TAGS.gs tab and delete it replacing it with all the code here and File > Save. 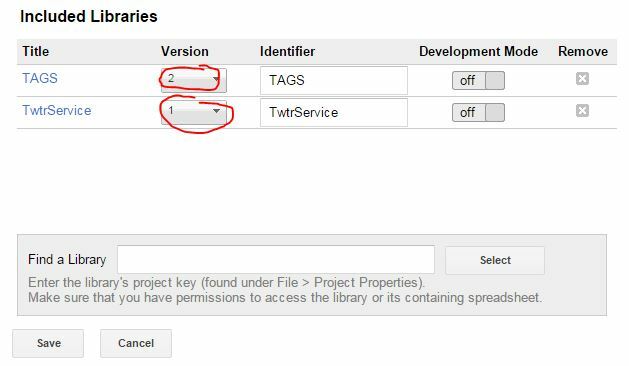 Remember to setup and automatic data collection you had in place using the Resources > Current project’s triggers or closing and reopening the spreadsheet and using the TAGS menu option.